Temporary signs giving public notice, such as political posters, advertisements of charitable functions, meeting notices, and other noncommercial signs of a similar nature, are permitted for a period not to exceed twenty (20) days and shall be removed by the person(s) who posted the signs. Temporary signs specified in this section shall not be attached to fences, trees, utility poles, or the like and shall not be placed in a position that will obstruct or impair vision or traffic or in any manner create a hazard or disturbance to the health and welfare of the general public. One temporary real estate sign attached to a building or free standing, may be erected advertising the sale, lease or rental of the premises upon which the sign is loca This sign shall be located on the property that is advertised for sale. Two signs may be utilized depending on the location of the business relative to the main highway. Unless prohibited by State authorities, one off-premises Temporary Real Estate Sign bearing only a general message such as “Home[s] For Sale [or Lease]” or “Land For Sale [or Lease]” and not identifying or advertising any real estate agency, agent or broker or one off-premises Temporary Real Estate sign bearing the message “Open House” (which may identify or advertise a real estate agency, agent or broker) may be placed at the entrance to a dead-end or cul-de-sac street for the purpose of directing motorists to property offered for sale on that stree Such sign may be located within the public right-of-way, but only in locations which do not interfere with vehicular or pedestrian traffic and which do not block the line of sight to and from vehicles exiting the street. Nothing in this subsection authorizes placement of any sign on private property without the permission of the property owner. Notwithstanding the provisions of Section XII(D), a temporary real estate sign advertising lots or homes for sale in a residential subdivision approved by the Scarborough Planning Board may have a gross display area of thirty-two square feet until such time as the last of the lots or houses is sold for use as a residence. Temporary Development or Construction Site. One temporary development or construction sign, attached to a building or free standing, may be erected provided such sign shall be limited to a general identification of the project and shall be removed within thirty (30) days after completion of the project. (60) days and shall be removed by the person(s) who posted the sign. A Temporary Grand Opening Sign shall comply with the Sign Dimensional Chart under Section XII.E. and the Variable Setback Standards of Section XII.G.3. of this Ordinance. To the extent permitted by State law, the operator of a Farm Stand or Agricultural Products Store may install a maximum of four (4) Off-Premises Farm Stand/Agricultural Products Store Signs for the purpose of directing motorists to the location where local agricultural products are offered for sale. Such Off-Premises Farm Stand/Agricultural Products Store Signs must be no more than eight square feet in gross display area and must be located within five miles, road distance, of the farm stand or store. Farm Stand/Agricultural Products Store Signs may be placed in off-premises locations only during periods of the year when the stand or store is open and the product or products identified on the sign are available for sale, or such other time periods as provided in state law. Off-premises Farm Stand/Agricultural Products Store Signs may be located within the right-of-way only on highways which receive no federal aid and only at the edge of the right-of-way, in locations which do not interfere with vehicular or pedestrian traffic and which do not interfere with visibility for pedestrians or motorists. Nothing in this subsection authorizes the placement of any sign on private property without the consent of the property owner. One (1) Temporary Going Out of Business Sign may be installed on the premises of a retail business and service establishment, personal service establishment, restaurant establishment, business service and business office establishment, financial, insurance, or real estate establishment, health club, hotel or motel, or a fully enclosed place of assembly, amusement, culture and government for the purposes of announcing that the establishment is going out of business. Business establishments located on corner lots may install two (2) Temporary Going Out of Business Signs. In the instance of two signs, the total gross area of the two signs shall not exceed the maximum sign gross area allowed under subsection E. Temporary Going Out of Business Signs may be in the form of a banner or window sign. The display of a Temporary Going Out of Business Sign shall be limited to no more than sixty (60) days and shall be removed by the person(s) who posted the sign. A Temporary Going Out of Business Sign shall comply with the Sign Dimensional Chart under Section XII.E. and the Variable Setback Standards of Section XII.G.3. of this Ordinance. One (1) Sandwich Board Sign may be displayed on the premises of a retail business and service establishment, personal service establishment, restaurant establishment, business service and business office establishment, financial, insurance, or real estate establishment, health club, hotel or motel, or a fully enclosed place of assembly, amusement, culture and government for the purposes of advertising specials, other items for sale, or events being offered. Sandwich Board Signs shall be limited to a maximum gross area of eight (8) sq. ft. and a maximum height of 48”. The location of Sandwich Board Signs shall be limited to the sidewalk or walkway leading to the main entrance of the building in which the business is located and shall be located no greater than fifteen feet (15’) from the building’s main entrance. Sandwich Board Signs shall only be displayed during the hours the business or use is open for customers or visitors and shall not be counted toward calculating the maximum number of signs or the maximum gross display area of signs on the property. A Sandwich Board Sign shall require a sign permit, per subsection A.2., which will establish a business or uses ability to use such a sign and delineate the area in which it will be displayed. A Sandwich Board Sign shall be located on a sidewalk or walkway in a manner that it does not infringe on handicap accessibility or safe pedestrian movement and that safely secures the sign in one location. One (1) Temporary Relocation Sign may be installed on the premises of a retail business and service establishment, personal service establishment, restaurant establishment, business service and business office establishment, financial, insurance, or real estate establishment, health club, hotel or motel, or a fully enclosed place of assembly, amusement, culture and government for the purposes of announcing that the establishment is relocating. Business establishments located on corner lots may install two (2) Temporary Relocation Signs. 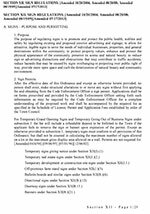 In the instance of two signs, the total gross area of the two signs shall not exceed the maximum sign gross area allowed under subsection E. Temporary Relocation Signs may be in the form of a banner or window sign. The display of a Temporary Relocation Sign shall be limited to no more than sixty (60) days and shall be removed by the person(s) who posted the sign. A Temporary Relocation Sign shall comply with the Sign Dimensional Chart under Section XII.E. and the Variable Setback Standards of Section XII.G.3.of this Ordinance. The nature of the businesses/institutions as they relate to public accessibility. Campus directional signs shall be permitted only in the TVC, TVC-2, TVC-3, TVC-4, B-2, B-3, BO-R, RH, RH2 HP and Industrial districts. The display area of campus directional signs shall be used to identify the names of destinations within the Unified Development and to provide directions to, from and within said development based on the criteria listed in Section K(1) (a) through (d). Depending upon the sign location, sign may be double-faced with information on the opposite side of the sign. Text messages on the sign faces must be of a size and typeface that is readable from a moving vehicle at the posted speed limi In no case shall the text be smaller than 3 inches in capital letter height. 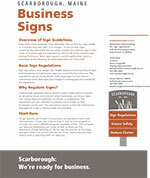 See Scarborough Design Standards for further description of signage requirements. The recommended minimum distance between campus directional signs shall be one hundred (100) feet. Campus directional signs shall be set back a minimum of fifteen (15) feet from the boundaries of the Unified Development. The maximum number of signs for the Unified Development shall be shown on a Signage Master Plan submitted to the Planning Board as part of Site Plan Approva The Master Plan shall indicate typical content for signs, allowing flexibility to change the wording without having to return to the Planning Board. Variations in the number or locations of signs shown on the Signage Master Plan must be approved by the Planning Board prior to implementation. See Scarborough Design Standards for further description of Signage Master Plan. Off-site directional signs shall not be considered campus directional sig However; for purposes of signage review, off campus directional signs that are part of a Unified Development shall be designed as part of the Signage Master Plan. Except as otherwise provided in this Subsection (F), a Business Directory Sign shall comply with all the requirements of this Section XII. A Business Directory Sign shall be deemed an on-premise, freestanding sign, not a billboard. Business Directory Signs shall be permitted only in the B-1, TVC, TVC-2, TVC-3, TVC-4, B-2, B-3, HP, BO-R, RH, RH2, CPD and Industrial districts. Notwithstanding the provisions of Sections XII(C) and XII(D), the maximum gross display area of a Business Directory Sign shall be 150 square feet. At least 10 percent of the gross display area shall be devoted to identifying the Unified Development by name (or by generic description such as “office park” or “shopping center” if no name has been assigned) and by street address on the Main Thoroughfare. The numbers of the street address must be no less than 11″ (eleven) inches high. The remaining gross display area may be used only to identify and advertise uses within the Unified Development and must be located below the name and street address of the Unified Development. Before the Building Inspector issues a permit for a Business Directory Sign, the Addressing Officer in coordination with the Town Planner must determine that the name of the Unified Development is not identical to or likely to be confused with the name of any other development already existing in Scarborough. Notwithstanding Subsection XII (F), no lot within a Unified Development which utilizes a Business Directory Sign may contain more than one freestanding sign, except that the lot on which the Business Directory Sign is located may contain both the Business Directory Sign and one other freestanding sign otherwise allowed by this Ordinance. The Building Inspector shall not issue a permit for a Business Directory Sign without the written consent of each lot owner within the Unified Development to the limitation of one freestanding sign per lot and the written agreement of the owner of any lot on which there are two or more freestanding signs to remove all but one of such signs upon the erection of the Business Directory Sign. A Business Directory Sign must be located on property within the Unified Development which abuts the Main Thoroughfare, must be visible from the Main Thoroughfare and must be located at or near the driveway or street entrance to the Unified Development in order to direct motorists to that entrance. When a Unified Development abuts and has a driveway or street entrance from more than one Main Thoroughfare, the Planning Board may approve one Business Directory Sign at or near the driveway or street entrance from each of the Main Thoroughfares for a total of two Business Directory Signs. Business Directory Signs shall comply with all applicable setback requirements, except that no setbacks shall be required from property lines separating lots within the Unified Development from one another or from common areas (other than streets), and no setbacks shall be required from boundaries of leasehold or easement interests (other than streets) within the Unified Development. No Business Directory Sign may be located within 200 feet of any other freestanding sign in the Unified Development. If provided, electrical service to a Business Directory Sign must be by underground wiring only. Each owner of a lot or unit of occupancy which is identified or advertised on a Business Directory Sign shall be responsible for any violations of this Ordinance arising out of the erection or maintenance of the Business Directory Sign and shall be deemed an owner of the sign under Section IV(C) of this Ordinance. The Town may enforce the provisions of this Ordinance against any or all such owners. Comply with Maine Department of Transportation “Regulations for the Installation of Official Business Directional Signs” except as is otherwise specified above. Maximum sign size shall not exceed 16″ x 72″; (Note: sign size to be determined by Maine DOT but not to exceed 16″ x 72″). Off-Premise Official Business Directional Signs shall not be located within the Haigis Parkway Right-of-Way between Payne Road and Route One. Business establishments undertaken and permitted pursuant to the provisions for home occupations shall not be permitted directional signs under this section. the Zoning Board must specify the approved number(s) and location(s) of additional signs based upon the provisions of this section. Apply to MaineDOT. Fill out the Sign Application Form. Fill out the Town’s Sign Permit Application.